DOT Desk: A bridge near Betka area in Tangail Sadar upazila has turned into a death trap, because of its dilapidated condition, reports DhakaTribune. Rods are sticking out of the deteriorating bridge structure. People from the nearby regions—including from the Boali, Nagar Jalafai, and Ashikpur areas—are forced to cross the risky bridge, because they have no alternatives. The movement of three-wheelers, vans, and pickup trucks has stopped completely for the past few days due to safety concerns. 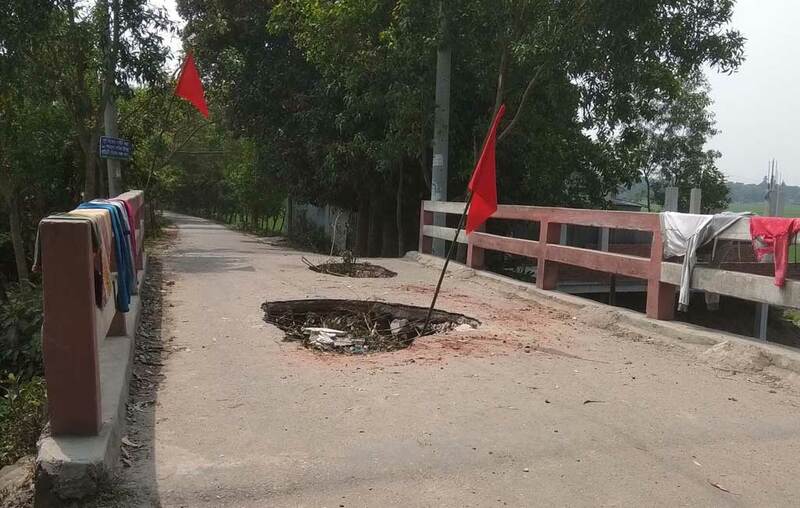 Visiting the area, the Dhaka Tribune found that red flags have been hoisted on both sides of the damaged bridge, to warn people of the danger. The condition of the bridge is deteriorating and all vehicle movement over it has been suspended for the last couple of days. The dilapidated bridge is causing immense suffering for the people of the region. A resident of Betka area, Nazim Uddin said: “Part of the bridge collapsed around 90 days ago. Complaints have been submitted to local Upazila Parishad (UP) members, the chairman, and the authorities concerned, but steps to repair the bridge are yet to be taken.